Cambodia’s mango shipments have been routinely blocked before making it to the international market, with the Ministry of Agriculture claiming the mangoes are not of a high enough quality to meet the sanitary and phytosanitary (SPS) requirements necessary to ship outside of the Kingdom. According to Hean Vanhan, director general at the General Directorate of Agriculture, the main obstacle for Cambodian mangoes making it to the international market has been the prevalence of fruit flies, which infest prospective shipments of the produce. “It is not a matter of the quality of our mango – the main obstacle to the market is the fruit fly, which blocks our mango exports and makes it difficult to achieve SPS certification,” he said, adding that the SPS certificate could only be granted to shipments of mangoes devoid of “injurious pests”. Cambodia’s annual mango production is about 1 million tonnes, Vanhan said, but the Kingdom will continue to be cut off from surrounding markets until farmers manage to rid their produce of invasive flies. In Chayvan, president of Kampong Speu Mangoes Association, said that while the fruit fly has been a problem for mango farmers in the past, most have established methods that ensure there are few to no flies in their mango shipments. The real reason Cambodia’s mangoes are unable to reach the international market, he said, is because they are often blocked for perceived hygiene-related issues, and he urged the Ministry of Agriculture to hasten its administration of SPS certificates to encourage neighbouring countries to buy Cambodian produce. 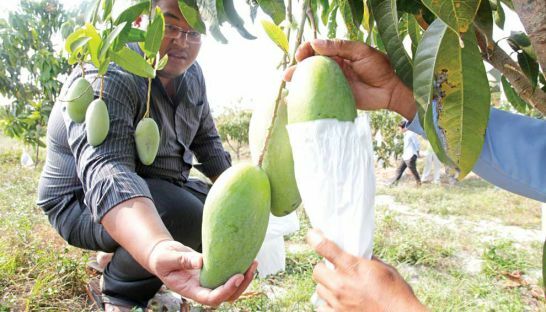 He added that Japan and Korea required advanced farming techniques that Cambodia could not yet meet, but that China and other neighbouring countries would be prime markets for the Kingdom’s mangoes to enter, if they were granted SPS certification. But according to Vanhan, the SPS certification should not be easily awarded in order to ensure quality control.